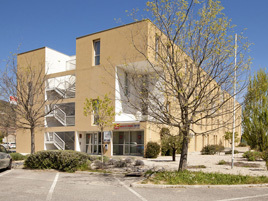 The aparthotel enjoys an ideal location close to all conveniences (shops, train station, access to the Marseille/Grenoble highway…). The extended stay hotel is located in the heart of the Alpes-de-Haute-Provence department, 1.5 km from the town center, with shops nearby. From Jean Giono, a local author, to the Colline de Toutes Aures hill, from the Mont d'Or hill to the narrow alleyways of the historic center, come explore the architectural and natural beauty of Manosque. Music, theater, exhibitions, readings, and shows are waiting to entertain you year round. Finally, at Vannades Lake and Pélicier Forest enjoy the pleasure of relaxing alone, with family, or friends. The aparthotel offers suites, ranging from studios to a two-bedrooms (6 people), with 94 apartments on 3 floors. The apartments are furnished and fitted-out, and include: a living room with a convertible sofa that sleeps two, two single beds or a double bed, an LCD television, an office area, a fully-equipped kitchen (hotplate, refrigerator, microwave, and dishes), and bathroom with towel warmer and drying rack.